“We believe that everyone is inherently good. That every person has the capability to be kind and sincere. For many people, they need to be given the opportune medium to express that kindness. This belief is in part of why we made Simply, I’m Here. Simply, I’m Here is a project where we ask people to tweet kind and sincere messages with #simplyimhere, and then we hand-write the message onto a postcard and mail it out to a random person. We want to make as many people’s days as we can in this process. It’s a simple mission, but we believe that handwritten words on physical mail can make a difference for someone. Getting mail is like getting a present. There is an undeniable joy in receiving a package, letter from a friend, or even a postcard from farr away. Simply, I’m Here aims to provide people with tangible evidence of humanity’s love story. This story is that inherent kindness that people have for each other, that may not be expressed as much as it should. We are using Twitter because we can see any tweet with #SimplyImHere from anywhere in the world. By having a hashtag where people can create kindness, this enables people to digitally write postcards, and not require them to physically seek out our project to write a message. We are starting with Twitter, and as it grows we might move to other social networks. 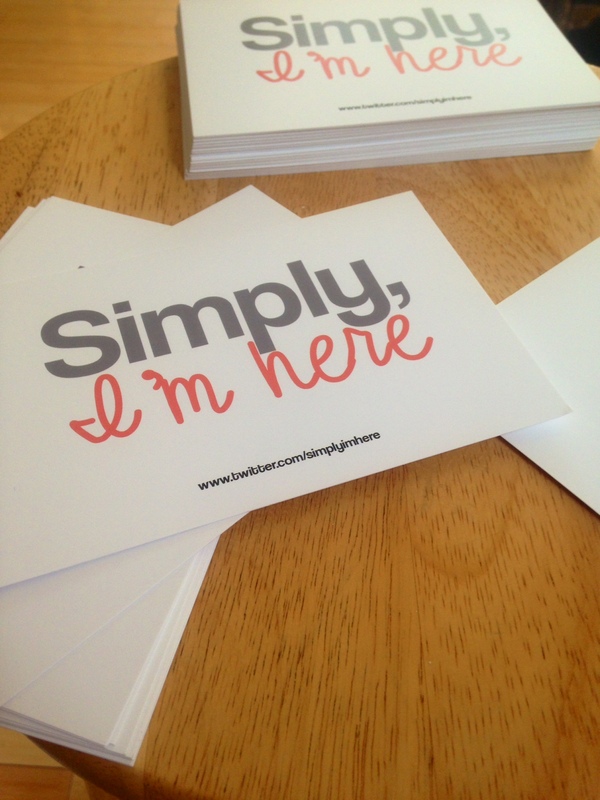 Simply, I’m Here is completely free to have a postcard written and sent out. We pay out of our own pocket to sustain the project at this moment. We are about to open our online store where people can buy merchandise that supports the cause and adds to our project’s longevity. A photo of what the first 50 postcards look like. We start by opening a phone-book, and randomly picking an address. We write the address and send it off. Other online directories will be utilized to pick addresses, and we certainly welcome anyone mailing us a phone-book. We are excited to see the organization grow and how people interact with it. We hope that as many people write kind messages as possible. Simply, I’m Here’s sincerity comes from it’s simplicity. Currently we (Robb Anthony & Lily Warto) are the only two people running the organization. Our Twitter account is not an automated robot, and we do hand write the messages postcards and mail them out ourselves. Thank you for hearing us out! Next Post: When You Hear What This 94-year-old Grocery Bagger Got On His Last Day, You’ll Be Pleased.